Travel to Nuremberg, Germany, and tour the 1000-year-old city with a Local Guide. Next, cruise to Regensburg, the only German city not bombed during WWII, and follow traces of its Jewish history from the Middle Ages. See the ancient Porta Pretoria, gates to a Roman fort built in 179 AD. In Passau, explore its narrow, winding streets, and see the magnificent baroque St. Stephen’s Cathedral. In Melk, visit Austria’s majestic Benedictine Abbey, one of Eu-rope’s largest monasteries, which sits high on a bluff. Take in the breathtaking views before continuing through the picturesque Wachau Valley to the romantic sounds of Vienna, the "City of Music." Join a guided city tour and discov-er the Jewish life in the last century. 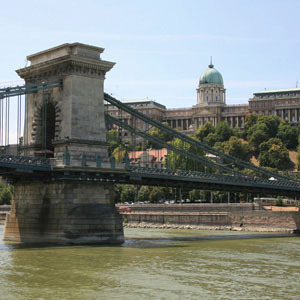 Your European river cruise vacation ends in Budapest, the capital of Hungary, with guided sightseeing and a tour focused on the Jewish Heritage of the city.